Cover raisins with warm water and soak 20 minutes. Preheat oven to 375°F. Cut squash into quarters; remove seeds. Place squash on baking sheet. Spray inside of each squash quarter with cooking spray. Combine sweetener and cinnamon in small bowl; sprinkle squash quarters with half of cinnamon mixture. Bake 10 minutes. Meanwhile, cut apples into quarters; remove cores. Chop apples into 1/2-inch pieces. Drain raisins. Melt butter in medium saucepan over medium heat. Add apples, raisins, and remaining cinnamon mixture; cook and stir 1 minute. 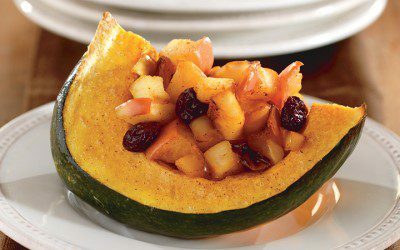 Top partially baked squash with equal amounts apple mixture. Bake 30 to 35 minutes or until apples and squash are tender. Serve warm. Exchanges per serving: 1 Bread/Starch, 1/2 Fruit.